I love pretty candles, but I don't love paying for them. So I decided to make my own! Actually burning candles is a hard thing for me. I recently heard a TV designer say, "Candles are meant to be burned, not dusted." Oops. BUSTED. But honestly, candles are so expensive! I love candlelight, but I find myself reluctant to burn candles, because then I have to replace them. 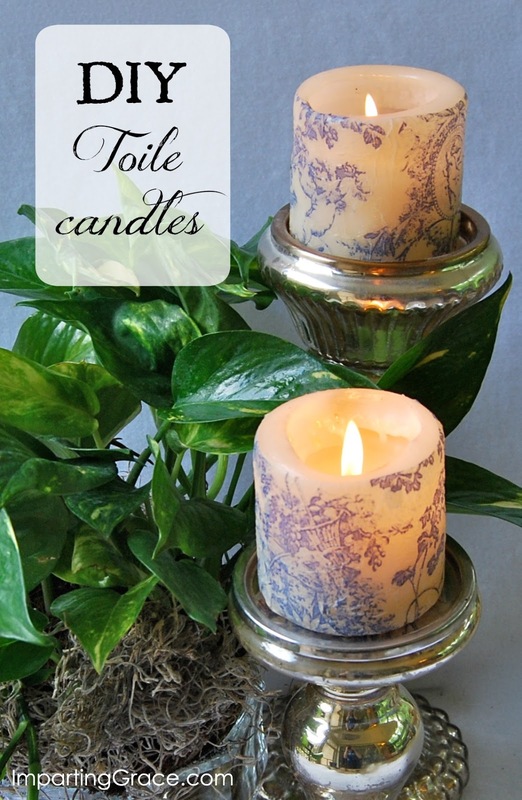 Check out this toile candle, though. Isn't it pretty burning at night? I made these myself by decoupaging napkins onto plain $1 candles. 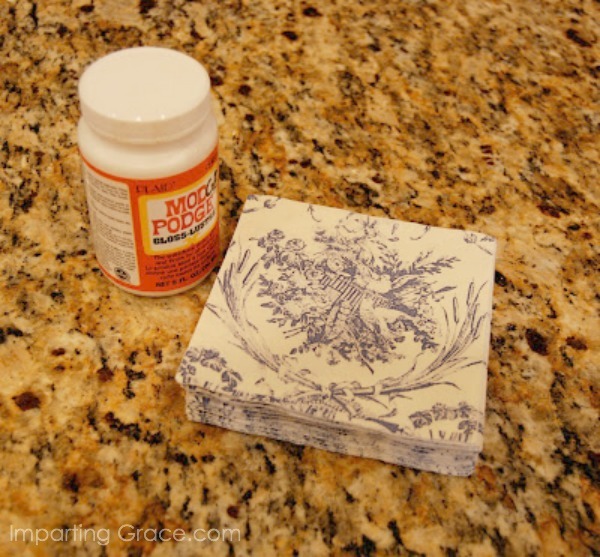 Seriously--all it took was a couple of cheap candles, a pretty napkin, some Mod Podge, and a few minutes. Click here to see exactly how I made these. Now I can burn these all I want, and when I need new ones, I can just make some more! Thank you, Manuela, for the idea! Oh Richella, I am so longing for spring. But today is going to be 37 degrees and sunny which makes it a little more bearable at least. :) I love candles. I just love the mood it creates. Your candle looks just beautiful! Your home looks so warm and cozy. I'm a gardener at heart so I've enjoyed the winter we've had, but I'm ready for it to be over. Although I was told today that we may have a frost as late as the end of April (which is unheard of in Georgia). I think I'll start some seeds indoors! I'm so glad you showed these photos of your pretty bedroom. I was wondering just this week if you had ever posted pictures of more personal rooms of your home. Every room of yours is lovely! And candles are always a good choice. Thanks for the linky love, my friend! Oh what a wonderful idea. I will steal this from you right away! I burn lots of candles around here, you are right they can cost a bit, but can be found for less at Ross, KMart, Target etc. That's where I buy mine. None of those $35 candles around here, no sir! I also always change my bedding and pillows and throws all around the house for the different seasons. It's fun and adds some interest to the room without costing much. Cozies up the place in the winter for sure! Spring is right around the corner,don't you worry! Have a great weekend. I am starting to get Cabin Fever a little but still enjoying the snuggling. Shut the front dorr...decopauging candles??? What a fantastic idea. I will definitley be stealing/borrowing/copying this one! Your home looks so inviting Richella. I would love to snuggle up on that cozy couch, and I know I'd feel right at home doing it to!